I made a wand fulfilling some of these requirements as one of my first magical projects, using a pine dowel and a woodburner and only half the inscriptions (the godnames with the symbols). I got the details from Frater Rufus Opus’ Black Work coursework, where he only listed the godnames and symbols, but not the “Ego Alpha et Omega” part. I augmented this with a small carved tip, blackened with the woodburner, to act as a “point” to the wand. This wand served me well, and one of my other magical friends evaluated it as pretty powerful given its near-constant use in my conjuration and magical work. Still, this wand didn’t quite fulfill the mark as a true Trithemius-style wand, since it wasn’t made of ebony, inscribed with gold, or had the “Ego Alpha et Omega” inscription. I made another wand, this time using a simple dowel without any elaborate carvings, and using the inscriptions from the DSIC to the letter. Still, due to a dearth of available ebony and gold, I stuck to using the available wood I had, this time an oak dowel. This wand wasn’t for me, but it worked well all the same. I made a similar wand as well for my sister as part of a DSIC kit I made her (a Table of Practice and a wand), again out of oak, but closer in appearance to how the wand should look according to DSIC specification. I prepared the wand using ebony stain and inlaid faux-gold leaf into the woodburned areas, which turned out fairly nice. Pretty, but again, not for me and not to spec. Skip ahead a few months. I read on the blogosphere that Fr. Rufus Opus got a DSIC-spec ebony wand made by Fr. Ashen, a grimoire magician who goes the extra light-year in procuring and making high-quality and dedicated tools for magical workings according to the grimoires he pulls them from. Fr. Rufus Opus advertised that there were two other wands for sale, but I was content with my non-spec Trithemius wand and wanted to make such a wand myself eventually. Little did I know then that Fr. Ashen was working on a book, Gateways through Stone and Circle (abbreviated GTSC), a strict grimoire magician’s interpretation of the DSIC ritual, tools, and experiences. In this book he details (among much else) the exact procedure in how he made the wand and the supplies he used for the wand. I got this book myself shortly after its release in 2013, and studied the procedure he used. However, ebony is a very hard wood, and harder to come by. I couldn’t find much ebony, and what I could find wasn’t long or wide enough for my purposes. Specifically, I needed African or gaboon ebony, known for its magical potency and use in the Western tradition as the magical wood par excellence. Plus, I also wanted the wand to match the length between my elbow and middle fingertip, so that the wand would be properly sized and “fitted” for my use. Most dowels I could find ran easily above $70, and were far shorter than the desired length I wanted. However, a good occultist friend who had a good amount of money built up from her career was planning to get a few ebony wands cut for herself and friends from large planks of the wood, and offered me one, custom cut and turned by a master woodworker, in exchange for a divination reading. This friend who goes by the name of Soror Satelle, needless to say, is awesome. The upper row consists of symbols taken from the design for the wand from book II, chapter 8 of the Key of Solomon. I used the specific design of the symbols from Mathers’ version, which use a slightly cleaned-up version of the symbols. Joseph H. Peterson of Esoteric Archives theorizes that these symbols are a highly devolved version of several godnames that might share an origin with Trithemius’ DSIC design. 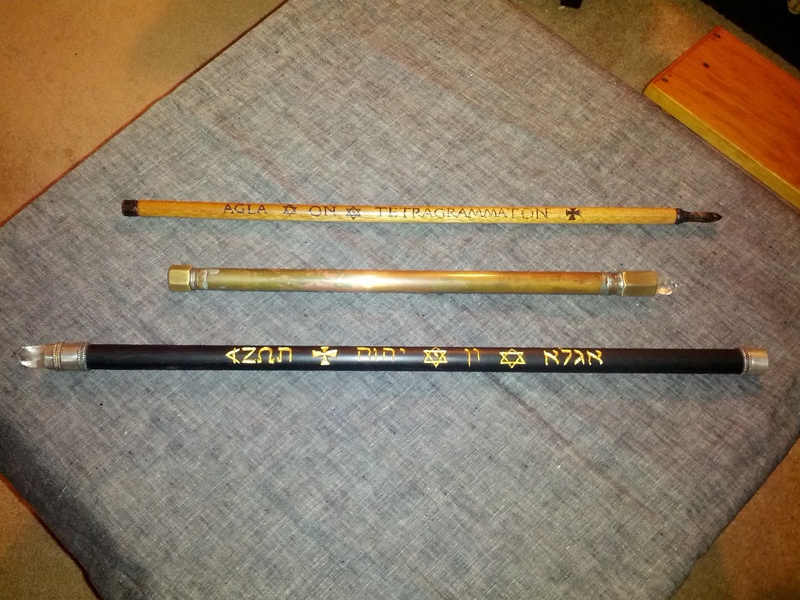 The lower row consists of the godnames Agla, On, and Tetragrammaton written in their Hebrew equivalents (אגלא, ון, יהוה) with the appropriate symbols. The first godname, Agla, is a Hebrew abbreviation for the phrase “Thou art mighty forever, Lord”; the third godname, the Tetragrammaton, is that most famous and ineffable Name of God. The second name, On, posed some problems, since I had never seen it written in Hebrew. Mathers uses עון (Ayin Vav Nun), but this has meanings of sin or iniquity, which makes this spelling unlikely; the spelling און (Aleph Vav Nun) means similar, but also has connotations of power or virility. In the end, I went with the simpler ון (Vav Nun), which is most likely considering the name’s likely Greek origins, with the meaning of “being” or “entity”, as in The Thing, or The One. Fr. Ashen in GTSC says that On means something like “pillar” or “support”. All this is augmented with the word AZOTH, written in a combination of Phoenician, Latin, Greek, and Hebrew scripts to replace the phrase “Ego Alpha et Omega” (cf. my notes on this word and why I chose to replace the phrase with this word). The ebony dowel, as I mentioned before, was given to me as a gift. The process of gilding (applying gold leaf to a surface) is first prepared by painting the area with red bole, to give the gold leaf a much more vivid appearance and a smooth surface to be gilded onto. The gold leaf is glued onto the wand using the sizing oil, with which I mixed in three drops of holy oil and one of Abramelin oil to consecrate the wand and the gold at once. This wasn’t just any holy oil, but holy oil that had been set atop the tomb of Jesus Christ in Jerusalem, also given to me by the same friend who gave me the dowel (she truly is an amazing woman). From my metal- and stoneworker friend, Raven Orthaevelve, I got some silver metal to melt into an alloy for the metal caps, and also bought a quartz crystal point. I found a particular point just the right size for the wand project with a smooth, sanded base; Raven had prepared this crystal just for a wand project, but never got around to making one using the crystal. How coincidental and fortuitous, indeed! I considered using other types of crystals for the wand, but clear quartz was the winner due to its broad and general use. Tools used for this project were many, but the big tools used were a flexshaft (a high-power rotary engraving tool with a long and flexible shaft for minute and detailed marks) for the engraving and a set of gilding tools (e.g. brushes for the sizing oil, knives to cut up the leaf and attach it to the wand). I borrowed these tools from Sr. Satelle and Raven, who are both amazingly generous and amazingly skilled at their own work and helped me with my own. I couldn’t use my battery-powered dremel tool for the ebony, since the wood is way too dense to engrave, and a woodburner wasn’t making anything more than a scratch; I needed actual horsepower for this. The gilding tools involve a set of very fine brushes, needed due to the very easy danger of scratching the gold with anything rougher and due to the tiny space to be inlaid. I conjure thee, o thou ebony wood and quartz crystal, by God the Father almighty, by the virtue of the heavens, of the stars, and of the angels who preside over them; by the virtue of stones, herbs, and animals; by the virtue of hail, snow, and wind; that thou receivest such virtue that thou mayest obtain without deceit the end which I desire in all things where I shall use thee; through God the creator of the ages, and emperor of the angels. Amen. DANI, LUMECH, AGALMATUROD, GEDIEL, PANI, CANELOAS, MEROD, LAMIDOC, BALDOC, ANERETON, METRATON, TUANCIA, COMPENDON, LAMEDON, CEDRION, ON, MYTRION, ANTON, SYON, SPISSON, LUPRATON, GION, GIMON, GERSON, AGLA, AGLAY, AGLAOD, AGLADIAMERON, angels most holy, be present for a guard unto this instrument. After this, I copied the design onto the wand using a black marker (barely visible except under bright light at the right angle), and took it over to Raven’s later on to use a flexshaft to engrave the wand. The engraving was actually fairly speedy, considering that I’m used to woodburning; the whole thing took about an hour to an hour and a half to engrave. Minor mistakes were easily fixed, though I would have liked a very fine sanding tool to polish out the engraved parts. Afterward, I cleaned off the wand from the pencil and marker, then used a glass polishing tool to burnish the wood and give it a nice sheen without the use of oils or shellac. The tool served to smooth out some of the engraved marks, which was also helpful. This all took place during the waning Moon, which I figured was appropriate; after all, even though I was working on the wand, I was making it less through engraving and removing parts of the wood, appropriate for the Moon while losing her light. I waited until the next Wednesday when the Moon was waxing again to start adding more to the wand, specifically the gilding. When that came around, I mixed a tablespoon of the sizing oil with three drops of the holy oil plus a drop of Abramelin oil. I applied the bole to the engravings with a fine brush, which dried quickly enough that I could do one row right after the other. I let the bole dry completely for an hour then applied the sizing oil to one row of engravings. After letting the sizing oil dry for about two hours, I took a sheet of gold leaf, cut it up into little chunks, then transferred it to the engravings bit by bit. I did this once, but went back a few hours later and redid it since I noticed I had missed some parts of the engravings with the oil and wanted the gold leaf to take better to it; this went faster since I knew what I was doing by that point. After letting that dry, I went ahead and did the same process on the other side. I let the wand dry overnight and over the next day, then went over the gilded engravings to smooth them out before going over the whole wand with a wide soft brush and coarse paper towel to knock off all the rest of the leaf and gently scrub off any extra that had stuck to the wand. After this and after the wand was dry and clean to my satisfaction, I let the gilded wand cure for a week without touching it so that the gold leaf would be permanently fixed on. At this point, the wand fulfilled all the (somewhat modified) specs of the DSIC wand: ebony, gold, and holy names and symbols. Even just after brushing off the extra gold leaf, holding the wand felt intensely powerful, and I can still swear I saw a light glow over the whole thing. However, being the fancy overachiever that I am, the wand was not yet finished, since I had yet to cap the ends ends with metal and the quartz point. My metalworker friend Raven and I decided to use silver for the caps, which gave the wand the two metals to represent the luminaries: lunar feminine silver and solar masculine gold. Later on in the year, in October during a waxing moon, she made fitted caps for the wand and crystal and I fixed them onto the wand with two-part epoxy, letting it cure for a day before using. I was going to take a cue from one of my older works and engrave the top cap with the Shema (שמע ישראל יהוה אלהינו יהוה אחד, “Hear, O Israel, the Lord is our God, the Lord is One”) and the bottom cap with a variant of the Gloria Patri in Greek (ΔΟΞΑ ΠΑΤΡΙ ΔΟΞΑ ΥΙΩ ΔΟΞΑ ΑΓΙΩ ΠΝΕΥΜΑΤΙ); this would kind of yield a tetrahedron, the Platonic solid associated with Fire, with a representation of Three on the bottom (Trinity) and One on the top (Achad). That said, I couldn’t get the design to look just right, and decided to opt for simplicity, with plain silver caps with a decorative trim at the end of each cap, and one at the base of the crystal. Simplicity does have its merits, after all. (name of God associated with their planet or element) most holy, almighty God most strong, deign to bless and to consecrate this wand, that it may obtain the necessary virtue through thee, O most holy Lord, whose kingdom endures unto the ages of the ages. Amen. (Angel name), in the name of the blessed (name of God associated with their planet or element), I conjure you to consecrate, sanctify, dedicate, bless, and empower this wand that it may serve for me a tool of my Will, God willing. Amen. (Intelligence name), in the name of the angel (angel name) and the blessed God (name of God associated with their planet or element), I conjure you to open the way, clear the path, and direct the forces under your power to empower and consecrate this wand that it may serve for me a tool of my Will, God willing. Amen. (Spirit name), in the name of the intelligence (intelligence name), the angel (angel name), and the blessed God (name of God associated with their planet or element), I conjure you to fill, suffuse, permeate, and completely empower this wand that it may be strengthened and consecrated that it may serve for me a tool of my Will, God willing. Amen. After making sure the angels, intelligences, and spirits (or kings, princes, and rulers for the elements) liked the wand and approved of it, I had them run a charge through the wand, so to speak, and help bring the thing truly and magically alive. Specifically with the blessing of Michael of Fire, I also consecrated the wand as my official elemental weapon of Fire, replacing my old fire wand in the process. Gabriel of Water didn’t consecrate the wand with elemental Water, technically, but did guide me through a type of ritual using a chalice to “anoint” it in a kind of Great Rite lite. Tzadqiel of Jupiter emphasized that the wand is not to be used freely, but as it’s indicative of a king’s scepter as well as the magus’ wand, it should be used as a reminder and channel for divine force and divine right, instead of temporary will and flights of fancy. Haniel of Venus didn’t think the wand was appropriate as a true Cytherean tool, but did mention its power in enabling things to grow and produce, important functions all the same. Both Raphael of Mercury and Tzaphqiel of Saturn referenced the similarity of the wand to the caduceus to guide and instruct with the blessing and authority of the Divine; Tzaphqiel further likened the wand to a pen, containing the vital essence of ink and the power to give the foundation of form without actually forming something itself, much as a pen can be used to draw out blueprints for a building but not produce the building itself. Interestingly, the angel Iophiel of the Fixed Stars didn’t much care to significantly bless or consecrate it, despite the masculine nature of the wand and the association of Chokmah with the Wands of the Tarot, but that’s a topic for another day. On the following Sunday morning, I made one final ritual of charging and empowering, applying a thin layer of solar fluid condenser to cover the wand and letting it dry while praying over it, similar to the original conjuration invocation. 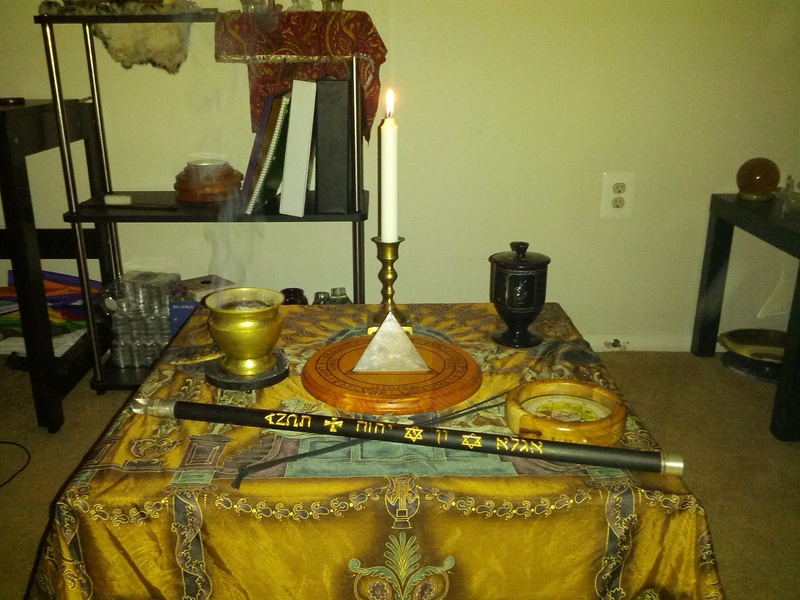 I made a final set of prayers over the wand, seeking the blessing and consecration of the wand as my primary tool of Will, especially that of my True Will from the Divine, and afterward performing a Litany to the Holy Archangels and other prayers over it. Having contact with my HGA made all this conjuration and consecration a lot smoother, since the HGA was able to help charge and direct the flow of forces as needed during the whole process. I wanted to do this at the same high place I made the original consecration at, but due to the weather, this wasn’t possible. Eventually, I may try to find a gnostic church or something to perform a Mass over the wand, because that would be a nifty empowerment for it. I’m thoroughly pleased with my new Wand of Art; I don’t think I’ll make something this high-quality anytime soon, if ever again. In terms of cost, this is certainly the most expensive project I’ve done. My estimates would probably amount to at least $350 for supplies alone, not to count the equipment cost (knives, brushes, flexshaft, etc. ), all of which would probably add up to $500. The time spent on the actual construction was about eight hours not counting the time spent waiting for things to dry or cure; consecration easily took at least 12 hours, if it all had to be done in one go. This is a quality artifact-level ritual tool that bristles with power and command; if I take on a lifelong disciple or student in the magical arts, this will probably be my heirloom gift as an inheritance to be passed down in apprenticeship, but otherwise I may just be buried with it. I can’t imagine ever selling something like this, especially since it’s truly a one-of-a-kind work that I may not have the chance to make again. Still, no matter how fancy this Wand of Art may be, it’s still just a wand, which is still a tool, which is meant to be used. It just happens to be a very powerful, very fancy, very glowy tool. Using this wand in my Work will be a true pleasure and joy, and will always remind me of the awesome help I got in its creation, from both spirit and friend alike. To my friends, I give my deepest thanks to Raven Orthaevelve for the use of her studio, equipment, and materials, and also to Sr. Satelle, whose extraordinary generosity made this project possible at all. Between the two of them, it was basically an exercise in crafting and less a quest of getting.